A Scrap at a Time: My Scraps and More Blog Hop!!! Hello and welcome to the My Scraps & More National Scrapbook Day Blog Hop! Each of the 6 designers has used one of the items in the image below in a project. For my product I got to use Fancy Pants Nautical envelopes and pockets. I had already fallen in love with the colors of this collection and had a lot of fun with these. I couldn't stop with just one page and ended up making 2. This first page uses the red chevron envelope. I love the bold look it gave to the page. Now if you pop on over to My Scraps and More forum you will see that my challenge is up for today and it is a lift of our wonderful store owner Audrey. Since I used some more of the pockets on my page I thought I would show it to you here. I went into creating this page with the intention of using the pockets to hold something but I just loved the detail of the shape that I ended up using them more like die cuts. Here is a close up of the green pocket used more like a die cut. Now hop on over to Wendi's blog and see what she got to play with. Here is the order of the hop in case you get lost along the way! Thanks for hopping and hope you have a happy National Scrapbook Day! Your colorful pages are fun! You know...I have some of those FP pockets but just haven't pulled them out. Thanks for the inspiration! Fun Fun pages!!! LOVE how you used the pockets!!! love the summer pages!!! I love the way you used those envelopes! Very creative! I am really digging that red chevron one! Great layouts! You have a fun style! Love the envelopes. Great pages. Love your bright sunny page and the fun it bring out of the photos. Wonderful layouts! I love the tilt to the upper and lower borders in the first and the pocket and chevron elements and loving the torn border up top on the second. I love how bright and cheery your pages are! Both layouts are awesome! Love all the color and those pockets look wonderful as die cuts! Great fun layouts!! I love the mix of "down" and "up" on the first one...very clever!! Your pages are really bright and fun! Love this! So bright and cheerful! Love both LOS. They are so bright and colorful. Great use of the envelopes! Love your creations! Thanks for the ideas. I love those pockets, but never know how to use them on the page. Beautiful LOs. Great summer layouts--I like how you used the envelope and pocket. Both of these layouts are awesome, love the colors!!! These both are great. love the colors and how bright it is!!! Sweet layout!! I love the red chevron envelope! It really hits the spot. The colors on the second layout are awesome! I love your layouts! The way the arrows reinforce the "going down" title is great. Love how the primary colors pop on the layouts! I like how you chose to use red and yellow on a page about water--I would never think to do that! Cool layouts! love how you used the chevrons to show him going down into the pool! I love the color scheme of the pages. Chevron envelope goes so well. I scream scream, you scream... For SUMMER.... Such fun, bright layouts. Great angles. Love using envelopes on my pages! This page is so fun.Happy NSD! The envelopes are so adorable and a fun pop of colour too. love the bright colors and another use for envelopes/pockets. thank you for the inspiration! Awesome colors! I always love using little bits and pieces, including envelopes, on my layouts! Just adds more interest and another layer! Cute, cute, cute!!! This is such a great, bright collection. Like how you've used the envelopes. Lovely page, and I like how you used the envelopes!! Love your misting on the layout. Grat use of the envelopes too! I love these layouts! Great use of color and the envelopes. I'm partial to the nautical collection living on the Great Lakes and seeing the lake and ocean ships. 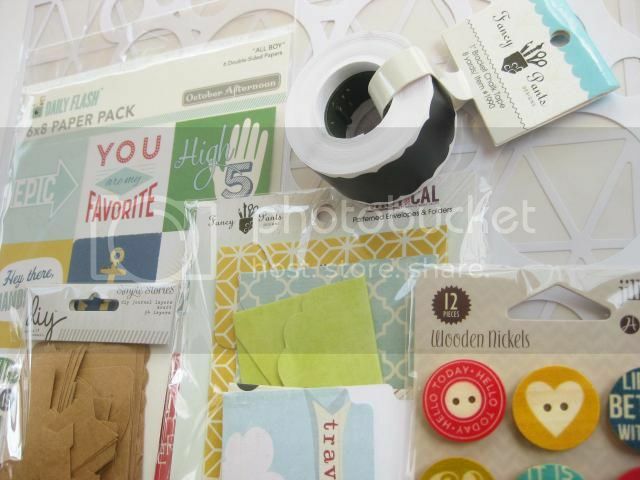 Envelopes are a fun way to keep loose keepsakes safe on a layout or card. Your LOs are so cute!! Fun way to use the envelopes! Love Fancy Pants envelopes!! Such fun pages! I love the bold colors on them and how you used the envelopes. Too fun! Love the layering with the envelopes. Love your layout and the use of the envelopes - really cute!